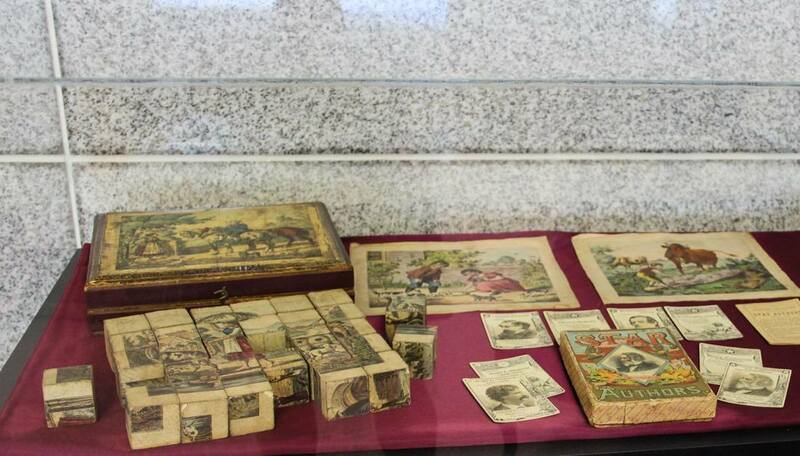 The materials on display included many fine examples of pastime entertainment from the 1800s and early 1900s, including puzzles, porcelain dolls, and hand-cranked box theaters. The exhibit also explored the art of souvenirs and the fine illustrations that were used in panoramas and folding tunnel books (also called peep shows) for remembering special occasions. This short clip features a tunnel book from the Great Exhibition in London in 1851. The book is being unfolded in an accordion-like manner to feature several layers and pop-ups within the book. It was one of a few tunnel books displayed in this exhibit. Book citation: Rawlins, Thomas J. Telescopic View of the Great Exhibition, 1851. London: printed by C. Moody, 1851?